Kettler has added 4 new machines to their selection of cross trainers that include the MONDEO ST CROSS TRAINER, the CTR 3 CROSS TRAINER, the VITO EXT CROSS TRAINER and the NORDIC TRAINER. Earlier this month we featured the all new Nordic Trainer, but today we have a look at the Mondeo ST Cross Trainer. The MONDEO ST is a good all-round cross trainer that works all major muscle groups. It is fitted with high quality double ball bearings and the rear disk joints have quality pendulum ball bearings which ensure a smooth action. It has a 15 stage resistance setup which is generated by a motorised magnetic-brake system. The display console is a high resolution LCD with twin display. The graphic display shows load profile while the digital display provides details of load stage, stride rate, speed, distance covered per session, total distance covered, energy consumption, pulse rate, exercising pulse rate with percentage display of set upper limit, recovery pulse rate with general fitness mark between 1 and 6. You can get your average values at end of training session for pulse rate, speed, and stride rate. There are many different pre-exercise settings which can easily be entered on the sweat-proof foil keypad. There are 8 different training programs to choose from including pulse-rate controlled training. 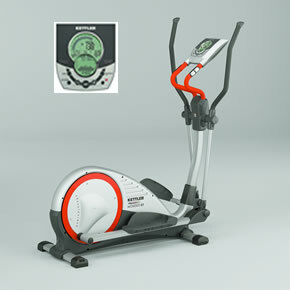 Kettler have just launched their new range of cardio machines that includes the Nordic Trainer. 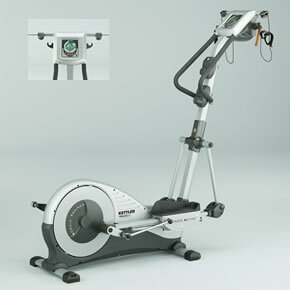 If you’re into cross-country skiing and want to get fit for the winter, then why not consider the Nordic Trainer. It combines tried and tested cross-country training technique known as “extended motion” with a rope-pull system, thereby effectively exercising all the body’s muscle groups. It’s not just a great workout for skiing but it also gives you a great cardio workout and also works your upper and lower body at the same time. With cushioned steps and freely swinging arms you can train just as effectively as when running. The main advantage of the Nordic Trainer is that you will be using considerably more muscles and avoid unnecessary strain on the joints. 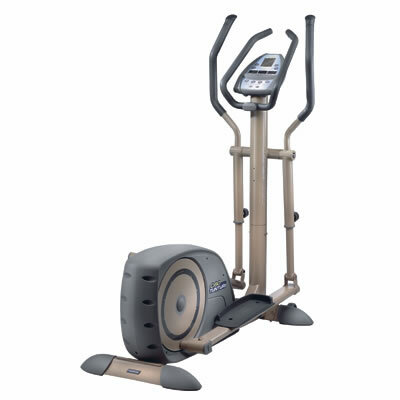 The long flat elliptical movement avoids the jarring impact of running when your foot hits the ground. The rope-pull system also helps to tone the muscles of your arms and torso. Not surprisingly, the calorie consumption and oxygen absorption are up to 50% higher than during normal walking. Regular exercise with the Nordic Trainer will surely help you to drop those excess pounds and get a great workout.